As a roofing contractor in Chicago IL, we know the damage roofs can take. Our team of experienced roof technicians can replace or repair any commercial or residential roof. Not only will we cover your roof repair, we will restore power and provide emergency generators when needed. Our Chicago roof repair crew also makes sure to clean up any debris left behind. Our goal is to start the restoration process as soon as possible. We provide emergency roofing services to the entire Chicagoland area. Click here to view our service area. Emergency Roofs is located at 332 S. Michigan Ave., Suite #10-p796. Chicago, IL 60604. We can be contacted 24/7 at (773) 770-4730. 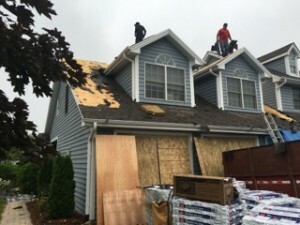 To get repairs completed quickly and safely, you need a restoration service company that specializes in Chicago roof repairs that will bring your home back to its pre-loss condition. As an emergency roofer that has experienced the hassles of home damage, we make it our goal to make your emergency roofing repairs quick and easy. We work with a variety of home insurers and can help you determine whether your damage is covered. We can also help with filing paperwork to keep your costs down. Don’t let storm damage bring down your property value, let our roof repairs Chicago experts help you! Call us for our 24 Hour Emergency Leak Repair and Roof Installation. As commercial emergency roofing contractors we’ve seen a lot of damage and what it does to the people affected. In an emergency situation, minimizing damage to your facilities, products, and equipment becomes the number one concern of each of our 150 employees. We allow you to rest easy knowing your commercial roofing repairs are in good hands. If you need emergency roof installation or roof leak repair, contact our Chicago roofing experts today at 1-773-770-4730.